Many times we go to the fabric store, buy the patterns and fabric we’ve been thinking about, and immediately head home and start cutting out the garment or craft item. This might work for most fabrics, most of the time; however it only takes one major mess-up to make a really bad day and perhaps cost us dearly because we’ve just ruined an expensive piece of fabric. Proper fabric preparation is essential prior to cutting the fabric, and you need to understand the basic facts of fabric structure before starting on the project. A firmly woven strip called selvage is formed along each lengthwise edge of the finished fabric. Grains indicate the yarn direction — lengthwise or crosswise. Any diagonal that intersects these two grainlines is bias. Lengthwise grain has very little give or stretch. Crosswise grain has more give and drapes differently, giving a fuller look to a garment. Bias stretches the most — a bias-cut garment usually drapes softly (example circular skirts), but also tends to be unstable at the hemline. A. Tearing is suitable for firmly woven fabrics. First make a scissors snip in one of the selvage edges; hold the fabric firmly and rip across to the opposite selvage. If the strip runs off to nothing part of the way across, repeat the process beginning farther from the edge. The “tearing” process will follow the thread line where you did the cutting, therefore making the edge straight when you get to the opposite selvage. B. A drawn thread is better for soft, stretchy or loose weaves. 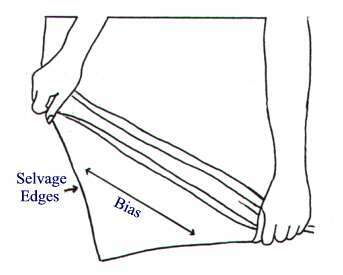 Again snip the selvage edge and pick up one or two of the crosswise threads and pull gently, as shown in the diagram. You will need to pull the thread and push the fabric until you reach the other selvage edge. Cut along the pulled thread line and you’ll have a straight edge for the fabric. After straightening the ends, fold the fabric lengthwise, bringing the selvages together and matching the crosswise ends. If the fabric edges fail to line up on three sides (as shown above), or if the edges line up but the corners do not form right angles, the fabric is off grain and must be re-aligned before cutting. Dampening the fabric is the first step in re-aligning it. This relaxes the finish, making the fabric more pliable. Fold the fabric lengthwise, matching the selvages and ends; baste the edges together. Enclose the fabric in a damp sheet (as shown above) and leave several hours; or moisten the fabric itself, using a sponge or spray bottle. Be sure to pretest a small area – if water damages the fabric, omit this step. Next, the fabric is stretched on the bias. This is usually sufficient to put it back in proper shape. Pull gently, but firmly, until the fabric is smooth and all corners form right angles. Use caution, however, because too much stretching can cause further distortion. Lay the fabric on a flat surface to dry then press if necessary. Sounds like a lot of work just to get the fabric back to the proper grain, but if you are making a suit or dress out of very expensive fabric, you will be very glad you took the time for this procedure. Another Neat Place to Print Your Own Fabric! My fabric cabinet(s) are filled to the top of most shelves with fabric of all sizes and yardages. I just can’t seem to walk by those fabrics in the stores that are “calling out for me!” I love fabric sales and it never fails – I also find regular priced stuff I just can’t live without. We’ve had a number of people who’ve emailed us about this same “problem” — what to do with the cabinets, drawers and stacks of fabric. OK, I’m going to try to offer a few suggestions and one thing that I do a couple times a year, and hopefully the suggestions will help you out. ** Take a day (or two) and go through ALL the fabric that you have. There may be some at the bottom of the stack that has been hidden for months or years that needs to come out. ** Refold all the fabric and put into stacks of “similar colors”, “similar yardages” or some other method whereby you will at least know what you have. ** Twice a year (spring and fall) the sewers in my subdivision have a “fabric swap”. We all bring fabrics that we really don’t think we’ll ever use, then trade fabric yardages with the others. For example, if I bring 5 pieces of fabric, I’ll get to pick 5 other pieces of fabric that the others have brought. We spend a couple hours having coffee and goodies, while exchanging the fabric. Of course, I haven’t gotten RID of any fabric – just replaced what I really didn’t want anymore. However, the good thing is that I now have fabric that I hopefully WILL use! 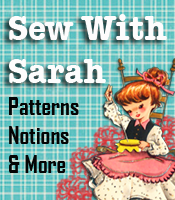 ** The PatternReview website has a “fabric stash” contest a couple times a year where you have a certain amount of time to sew as many items as you can (clothing and craft items). You use patterns you already have and fabric you already have. The purpose is to get you into those closets and drawers and USE what you have and get back into the sewing room! From the number of items the last winner made, I’d say she probably LIVED in the sewing room for the previous month or so!! ** Some of my sewing friends have those big clear plastic stackable boxes for their fabric. They sort it by colors – each clear box has a certain color (blues or greens, etc), then they have them stored on shelves at the back end of their garage. Works out great if you have a lot of fabric – and it’s all easy to see. ** If there are a number of pieces that you just don’t think you’ll be using at all, think about donating them to Good Will, or to a group that holds sewing classes – perhaps those in the sewing classes could put your extra fabric to good use. ** The very best suggestion of all is USE IT! Go ahead and get those clothing garments made, or start working on some craft items that you’ve been wanting to make, but just haven’t gotten around to it. Once you get the sewing machine humming, you might be surprised at how quickly the fabric stacks disappear. If you have any other suggestions for what to do with a stash of fabric, feel free to drop us a line – I’m sure our readers would love to hear other suggestions. Scraps! Scraps! Come Out Wherever You Are! Hancock Fabrics is celebrating their 54th anniversary with a huge sale where you can take 54% off most every type of fabric online, plus you get standard $4 shipping for your entire order through September 28th with no coupon needed! If you prefer to shop in the store be sure to print these terrific coupons for 40% off any one regular priced fabric item and 40% off any one sewing or quilting notion.